FIGURE 10-25 HRR of the MMTV promoter. 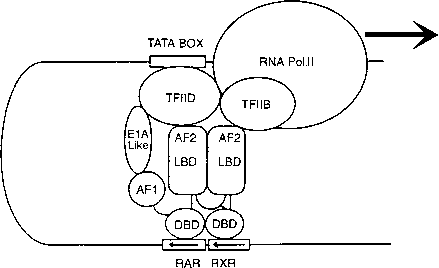 Schematic representation of the MMTV regulatory region, including the hormone regulatory region (HRR) with the receptor-binding sites (HRE 1-4), the palindromic binding site for CTF/NFI (NF-1), and the two octamer motifs (Octs) upstream of the TATA box (TFIID). The nucleotide sequence of the region between -187 and -37 is shown. Note the varied spacing of the half-palindromes in HRE1 and HRE2. Reproduced with permission from Truss, M., and Beato, M. (1993). Steroid hormone receptors: Interaction with deoxyribonucleic acid and transcription factors. Endocr. Rev. 14,459-479. 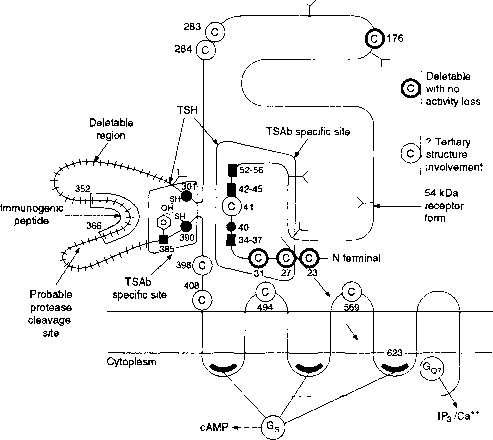 FIGURE 10-26 Model for the stabilization of the preinitiation complex by an RXR-RAR heterodimer. Reproduced with permission from Pfahl, M., Apfel, R., Bendik, I., Fanjul, A., Graupner, G., Lee, M.-O., La-Vista, N., Lu, X-P., Piedrafita, J., Ortiz, M. A., Salbert, G., and Zhang, X.-K. (1993). Nuclear retinoid receptors and their mechanism of action. Vitam. Horm., 49, 327-382.